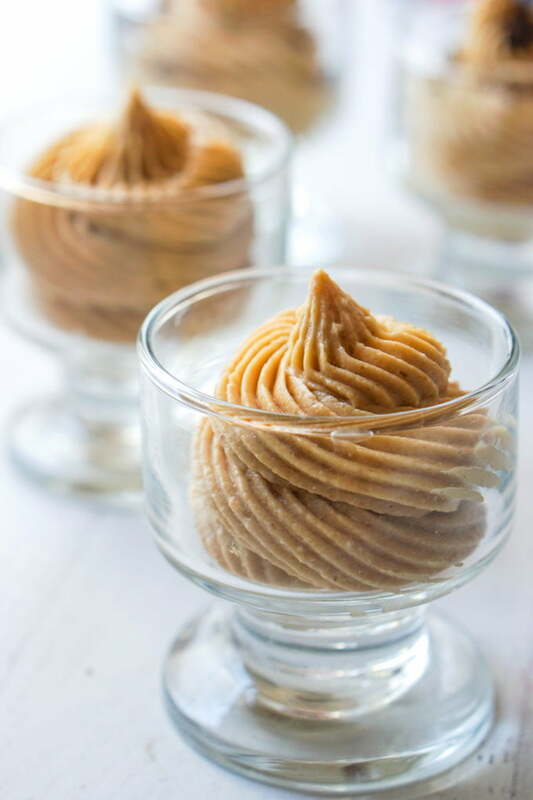 The keto peanut butter cheesecake mousse takes only 5 minutes because it’s a no bake dessert! This low carb cheesecake dessert is perfect for an easy Valentine’s Day dinner. Each serving has only 3.2g net carbs! You might also like this keto raspberry no bake cheesecake. I love peanut butter. Once I went to a family dinner and someone made a peanut butter pie that I still think about it. 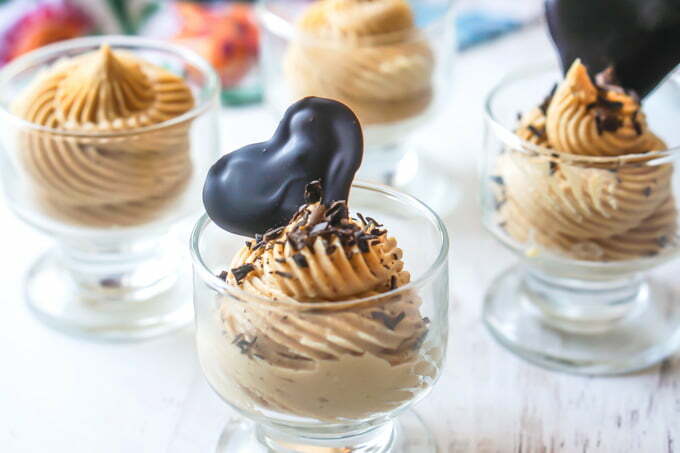 That is why I decided to make these keto peanut butter cheesecake mousse desserts for our Valentine’s Day dinner. I should have made something my husband would like but I’m much more of a sweets person so I thought he would forgive me. 🙂 They are super easy to make and I even put a little chocolate heart for some Valentine’s Day decoration. They are small but filling and have only 3.2g net carbs! I love keto cheesecake recipes like this one because it only takes about 5 minutes to make. All you need to do is mix together cream cheese, heavy cream, sweetener and flavoring and you are done. That’s why I have a few of these low carb cheesecake recipes on my site and they are some of my all time most popular recipes. The basis of the low carb cheesecake mousse is cream cheese, heavy cream, sweetener and flavoring. 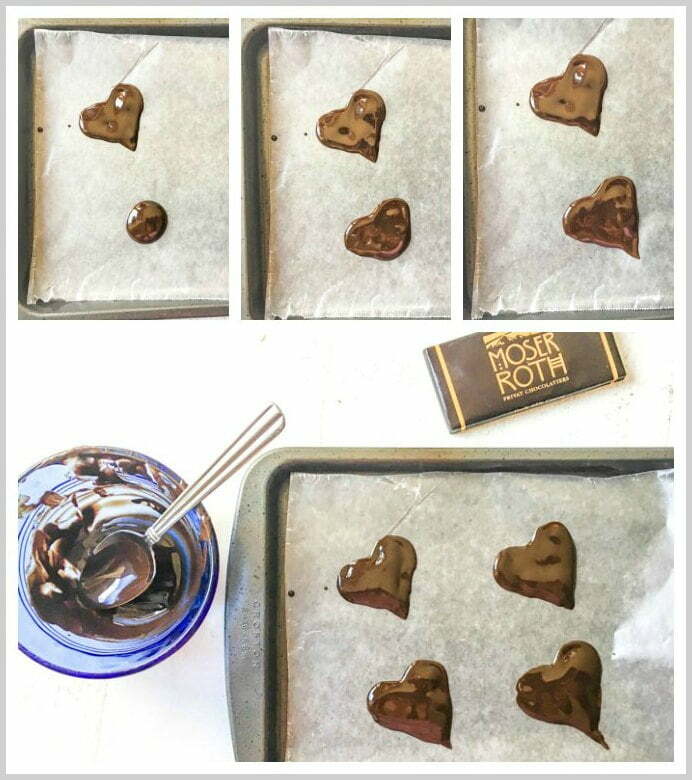 These chocolate hearts are really easy to make. You can see the photos below of how I did it. Take half of the small Moser’s dark chocolate bar and melted in the microwave for about 1 minute. Take it out and mix it well until everything is melted. Then on a wax paper covered baking tray use a little spoon and put a little dollop on the wax paper. Then taking the spoon and push the melted chocolate up on the sides and then dragged the bottom down to form a heart. Freeze them for 5 minutes and you are good to go! Use a low carb chocolate bar, melt it in the microwave and use a spoon to form a heart. I like this Moser 85% dark chocolate I get at Aldi. Each little bar like the one below has only 6 net carbs. I used 1/2 of the bar and got 4 hearts made. So that means each heart has roughly 0.8g net carbs. You can use any chocolate you want but remember to count the carbs. Below you can see that I also shaved the chocolate with a peeler and I also have Lilly’s chocolate chips. You can decorate with any of these things if you wish. I liked the shavings and hearts the best. I love these Moser’s 85% chocolate bars and Lily’s stevia chocolate chips. 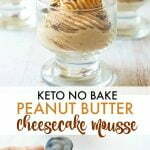 How to make the keto peanut butter cheesecake? First let your cream cheese soften on the counter. Then add it to a mixing bowl along with the heavy cream, sweetener, peanut butter and peanut butter powder. Cream all the ingredients together with a hand mixer and you are done. If you want you can pipe them into a little dessert dish. I used to use 4 oz mason jars but my husband took all of mine to put in his homemade chili powders. The ones below are 3.5 ounce dishes. I found these on Amazon that are similar. 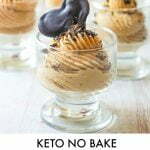 These dessert cups are small (3.5 oz) but this keto mousse is very filling. I got most of the ingredients at Aldi. The chocolate bars, peanut butter powder, unsweetened peanut butter, cream cheese and heavy cream. The Swerve sweetener and Lily’s chocolate chips I buy on Amazon. I got most of the ingredients at Aldi but you can also buy them on Amazon. Refrigerate these until you are ready to eat them and they keep for a few days. My batch made 5 of this size, so use that as a guide for your containers. Remember they are very rich and filling so less is more. Using 1 Moser 85% dark chocolate bars, each heart has roughly 0.8g net carbs. *Note I do not include the Swerve sweetener in the calculation as it has no carbs nor calories. Also I did not include the chocolate in the mousse calculation either. 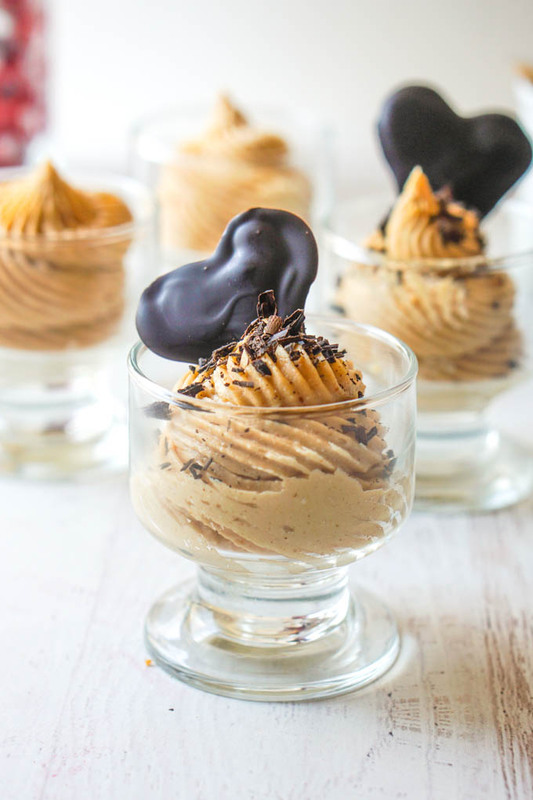 The keto peanut butter cheesecake mousse takes only 5 minutes because it's a no bake dessert! This low carb cheesecake dessert is perfect for an easy Valentine's Day dinner. Each serving has only 3.2g net carbs! 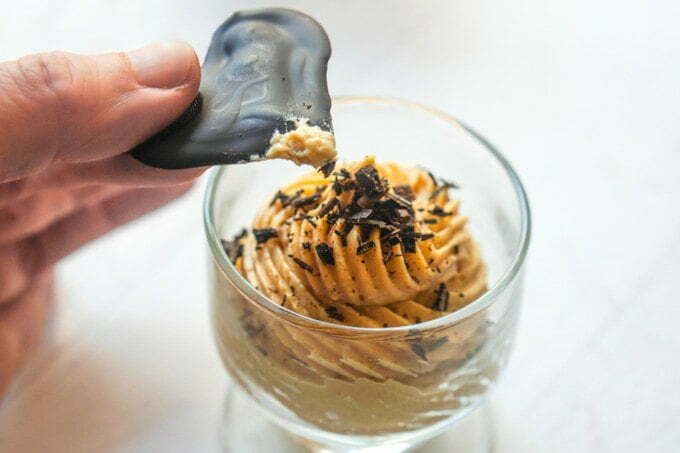 How to make the peanut butter mousse. Add all the ingredients to a mixing bowl and with a hand mixer cream together until the mousse is thick and creamy. Spoon or pipe into dessert cups and refrigerate until ready to eat. 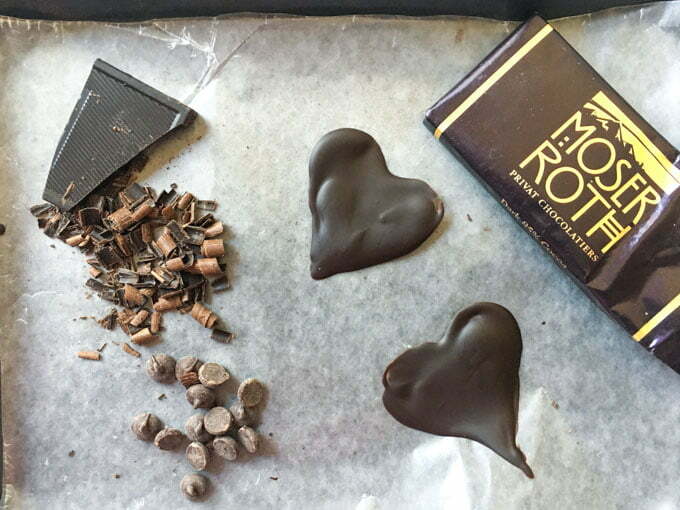 How to make the chocolate hearts. Melt 1/2 of a low carb chocolate bar in the microwave for 30 seconds. Take it out and stir until it's all melted. On a wax paper covered cookie sheet, take a small spoon and place a small circle of chocolate on the paper. Take your spoon and move the chocolate up to make the top of the heart. Then take the spoon and drag the chocolate at the bottom down to a point to form a heart. Do this with all of the chocolate. This should make 4 or 5 hearts. ** I used Aldi Simply Nature peanut butter and peanut butter powder. Both are just peanuts and no added sugar. I also used Moser's 85% dark chocolate bars as they are low in carbs. Each small bar has 6g net carbs. Previous Post: « Drunken Berries – a low carb Valentine’s Day dessert! I just made this with peanut butter powder and it turned out fantastic!! Even my 6 year old daughter loved it and she never likes any of my keto desserts. What a perfect, simple recipe to satisfy my craving for a treat. Thank you SO much!!! Hi Misty, so glad you liked them! … and your little one too! That is so cute. I love it!! I can use those little hearts any time. And your peanut butter mousse sounds so good. I love creamy desserts rather than anything heavy. I can almost taste that cold creamy mousse. I think I’ll surprise Hubby with this. I know he’ll enjoy it. Oh, this sounds so flavorful. I love how simple and easy this is. I could enjoy this when I am on my diet too. Such a pretty color too. I love easy dessert recipes like this. Low carb is a bonus! 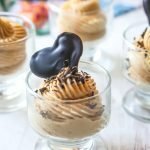 I love all your low carb desserts Denise! I can satisfy my cravings and not feel guilty about it 🙂 This is perfect for Valentine, I just hope I can make pretty chocolate hearts like yours!! If any one can, Jolina it is you! This looks so good. I am going to Aldi’s right now so I can make it. Thanks. BTW is Peanut Powder and Peanut Flour the same thing?? I been wondering about that. I used Peanut Butter Powder that I got from Aldi but I’m not sure it’s always there. You can just use more peanut butter if you want. I was hoping to get more flavor with less carbs, so just watch what the carbs are for any product you use. Good luck! The classic combination of flavours is always welcomed. My grandkids are coming over for a sleepover. I know they would love this for dessert (on both nights). Love those little hearts. Oh my word, this looks amazing! And I love that I found a dessert I can enjoy while I’m trying to lose weight. You won’t even know it’s a keto recipe.